OK, first off this is NOT a rock album, it is a smooth jazz / easy listening album. I know that my blog is titled “Rock Delight”, but I have many varying tastes when it comes to my music and if your not open to other forms of music then just pass this review up. My first taste of Lisa McClowery was on Jim Peterik’s 2008 smooth jazz album “LifeForce”, but had little knowledge of her prior to that. In the past few years she has become a sort of protege’ of Jim and her latest album “Time Signatures” is both written and produced by “Mr. Melody” himself. This album really shows how diverse Jim is as a songwriter. Style wise the songs are similar to the originals that were found on his “Lifeforce” album, but less smooth jazz and a bit more jazz/pop, and are a perfect match for Lisa’s voice, which is magnificient. 1. Time Signatures: Opens the album with an upbeat tempo and a great groove. 2. Waiting For You: A great smooth R&B beat very soulful and Lisa sings the hell out of it. The song itself sounds very Stevie Wonderish. 3. Born Twice: A great upbeat smooth jazz / pop song. 4. Come Dancing: This is just one of the most beautiful songs I have ever heard in my life. A big orchestrated ballad, it must be a wonderful thing to be so much in love with a person that you can get inspiration to write a song this beautiful. 5. Unconditional Surrender: Lisa sang this track on Jim’s “Lifeforce” album. It was great then and it is still great now. It is a perfect fit on this album and no question why it was placed here. 6. When the Phone Don’t Ring: Very atmospheric and moody, we have all been here. 7. When It Comes From The Heart: Another great ballad that ends the album. Very Inspirational and uplifting. It amazes me a that women with a voice as spectacular as this is not a worldwide sensation. 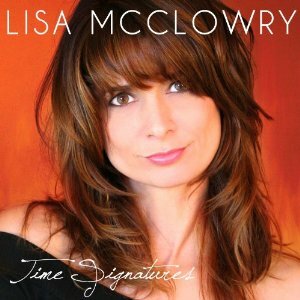 Lisa McClowery’s “Time Signatures” is a great album that has lots of groove. Jim “Mr. Melody” Peterik hits songwriting gold again.